York9 FC in training. (Photo courtesy York9 FC/Chant.ca). TORONTO — There is little indication that York9 FC has never played a match together. Early on in the team’s very first pre-season training sessions, it’s evident that head coach Jimmy Brennan has assembled a group of players ready to step into a professional environment and compete for all the glory that comes with it – while putting in that hard, hard work that it takes to succeed at the highest level. As this reporter watched on from the sidelines, York9 FC connected well on multiple set plays and passing or crossing drills. Players were in high spirits. And hungry, it was clear, to show their coaches what they’ve got with an eye toward a spot in the team’s first-ever starting lineups. Brennan, of course, is well-aware of exactly what sort of work that entails; the former Toronto FC captain and Canadian international has proved himself at home and abroad in England, where his club career saw him suit up for the likes of Bristol City, Nottingham Forest, Norwich, and Southampton. And, as he barks out instructions and whips his roster into tip-top form, he admitted to CanPL.ca that there’s a lot less on his plate than he first expected. “The big thing about this group is the professionalism of them all,” Brennan answered, when asked by CanPL.ca what his early impressions are of his York9 FC. “They’ve come in and they’re ready to work. Besides a “terrific work rate” and a “willingness to learn,” Brennan also heralded his side’s fitness level, pointing out that many of his players are in-shape and looking after themselves well. It bodes well for an away trip to Hamilton on April 27, where York9 FC plays visitors to Forge FC in the Canadian Premier League’s inaugural bout. While some players have emerged as leaders in his camp – Brennan highlights players like Luca Gasparotto, Manny Aparicio, Kyle Porter, Joseph Di Chiara and loanee Ryan Telfer for coming in without a chip on their shoulders – the Nine Stripes also have a healthy balance of young players fighting for a spot in the starting lineup. 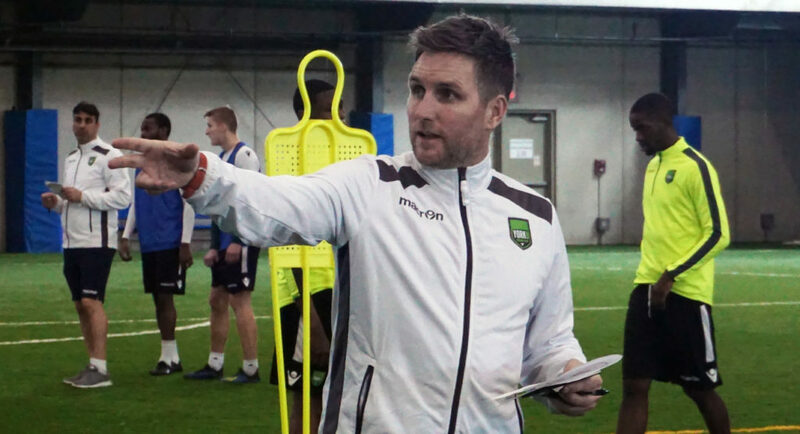 York9 FC head coach Jimmy Brennan directs training session. “You have to earn the right to play,” he continued. “Over these next seven, eight weeks, the best 11 is going to play. The guys who deserve it will get those chances. The ball’s in their court. It’s about how they handle themselves and how they work. They’ve got to put it on me where me and my coaching staff, we’ve got to make hard decisions about who will be in our lineup. Among the standouts in training and in scrimmages is Porter, 29, who was vocal with his teammates as he connected on attacking sequences. Having plied is trade across Canada and the United States, Porter came into the York9 camp admittedly unsure of what he’d soon find. But what has emerged upon the training grounds in Vaughan, Ont. has “exceeded” his expectations. “I didn’t expect us to be this athletic and this dynamic, how good we are on the ball,” Porter offered, when asked by CanPL.ca what his early impressions were of his team. “We’re still being put to the test by the coaching staff but overall, I’m very pleased with how this group has formed. “For a lot of players, it’s their dream to come back and play in their home country at a professional level,” he continued. “Now this league has given us that opportunity to do so. The first test ahead of the Nine Stripes is Forge FC. After that? The hard grind of a full campaign awaits York9 FC. With a quick primer on a vision of dictating the play through intelligent, controlled soccer, Brennan quickly returned to his coaching duties. York9 FC is hard at work.